Norman Lewis Ovenell, age 87, a lifetime resident and pioneer of the Skagit Valley and Concrete for the past 70 years, passed away Wed., Feb. 10, 2010, at St. Joseph Hospital in Bellingham, Wash., after a long and courageous battle with lung, heart, and kidney disease. He was born Sept. 20, 1922, in Burlington, Wash., to James and Mary (Dannenmiller) Ovenell. After graduating from Burlington High School, he purchased his own herd of milk cows and crop farmed on the family farm in Burlington. In the early 1940s, Norm, his cousins, and Harold Pierson cleared the P & O Ranch, which later became the Double O Ranch in Concrete. He was married to Eleanor Jungbluth on June 12, 1965, at St. Catherine’s Catholic Church in Concrete. They raised five daughters who continue his legacy. Dad is remembered as a devoted husband and father, one in a million! Norman, a longtime rancher, operated Double O Ranch in Concrete, raised and showed Maine-Anjou Cattle, and taught his daughters a strong work ethic and sense of family. Along with his wife and daughters, they began Ovenell’s Heritage Inn in 1997. He was one of the first Port Commissioners for Skagit County, was actively involved with conservation practices on his ranch and Skagit County Cattleman’s Assoc., and was involved as a 4-H leader and as a 4-H beef superintendent at the Skagit County Fair. Norman was an active member of St. Catherine’s Catholic Church and was instrumental in the construction of the CCD Center in Concrete. He played the accordion and banjo, and was known for his ability to work with his hands. Norman also owned an airplane and was known as “Stormin’ Norman” for obvious reasons! Norman is survived by his wife of 44 years, Eleanor Ovenell of Concrete; five daughters, Katherine Ovenell Roy and her husband Calvin of Emmett, Id., Kristin Ovenell Hansen and her husband Anthony of Concrete, Cynthia Ovenell Kleinhuizen and her husband Jason of Concrete, Karin Ovenell Carter and her husband Terry of Sedro-Woolley, and Helen Ovenell of Concrete; six grandchildren, Norman Scott Hansen, Tyler James Hansen, Zachary James Roy, Jacob Norman Roy, Serena Noel Roy, and Matthew Calvin Roy; his brother, Lyle Ovenell of Burlington; and numerous cousins. He was preceded in death by his parents and an infant sister. A Rosary was recited Tues., Feb. 16, 2010, at 9:30 a.m., followed by a Funeral Mass at 10 a.m., at Immaculate Heart of Mary Catholic Church in Sedro-Woolley with Father Martin Bourke as Celebrant. Memorials are suggested to St. Catherine’s Catholic Church or Skagit County Catholic Church building funds and Aero Skagit Ambulance Service in Concrete. Special thanks are extended to Dr. MaryAnn Hink, Dr. Kendregan, United General Hospital, St. Joseph Intensive Care unit, Skagit Valley Hospital, Option Care, Lincare, and Tracy and Hope Woods. Arrangements and services are under the care of Lemley Chapel, Sedro-Woolley. 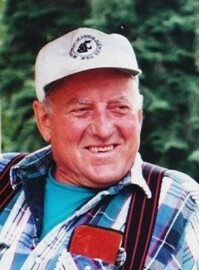 Please share your memories of Norman and sign the online guestbook at www.lemleychapel.com.